Rung to celebrate the life of Mary Atkinson, who died on October 31st, on what would have been her birthday weekend. Well done To Sue for being a “super sub” at short notice to step in after another ringer fell ill and doing such a wonderful job. Well done too to Thomas and further developing his ringing abilities. Rung as a wedding compliment to Alan Wordie’s daughter Rosanna on her marriage to James . Rung from a temporary wooden platform with emergency lighting and no heating as the church is closed until May 2019, for re-ordering works. No.5 First Quarter Peal in the Method to celebrate the occasion of his 65th Birthday and officially becoming an OAP. Dedication To Stephen Last, 69, who died this week, a good friend to the Barrowden Bellringing Band. As the nearest neighbour to St Peters he was known to like the bells ringing but often commented that he could never hear himself speak on practice nights. Sad news, he will be missed. Morrison 720, Pitman 240, Morris 240 + 60. 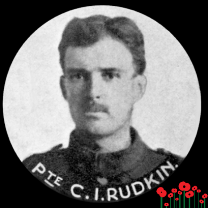 Rung in memory of Private Charles Iliffe Rudkin of 1st Leicesters. Died this day 1918. Resident and ringer at Ridlington. Only the one QP in July, as reported in the last newsletter. Here with photo of the occasion. Congratulations to Sue’s daughter Gina on achieving her first class honours degree. Rung in memory of Lionel Atton past tower captain of Braunston in Rutland, who taught 1, 3 and 6 to ring. To celebrate John Nicholl's 80th birthday today. Birthday compliment to Mary Davidson of the local band. 53 courses, three plain leads of Bob Minimus with No.5 covering and No.6 following. Rung as a 65th birthday compliment to Ian McKelvey and for Brooke harvest festival. A Silver Wedding compliment to Janice & David Atkinson for July 9th. Also rung to celebrate Tom Beadman achieving 3 A*s in his A Levels and wishing him well studying Medicine at Nottingham. For Rutland Branch Quarter Peal Month. In celebration of the tenth birthday of Tom Thorpe, son of 3 & 6. Congratulations from Alan Wordie to Eloise for a very well struck QP, and then a week later for ringing PB Minor inside and also treble to Kent.Treble BobWhat next week?? Many congratulations also from the branch – well done indeed! Rutland branch quarter peal month. To mark 50 years of ringing by Ann Williams, and remembering Charlie Hudson who taught her. Specially arranged as a 90th birthday compliment this day to local tower captain Tony Clark by long time ringing friends. Monday, 4 June 2012 in 47 minutes (10.2.4)1320 Plain Bob Minor 1. First of surprise for Fabio who rang very well. As Ayston bells are virtually unringable and the bride wanted bells for her wedding, she thought it would be a good idea, as the reception was at the Old White Hart, Lyddington, to have them rung there as the guests arrived. Congratulations to Hilary – all this training has paid off! Rung to mark Armistice Day, 75th Birthday of Peggy Jennings (10.11.10) and in memorium to David Clements, who supported Oakham a great deal. He is sorely missed. A birthday compliment to Janice and A level congratulations to Jack. Quarter peal of Plain Bob Triples - 1274 changes in 48 minutes. 1260 Stedman, Plain Bob, St.Simon's and St.Martin's Bob Doubles. A retirement compliment to John Nicholls after 30 years dedicated service as a churchwarden at Caldecott. Rung to celebrate the life of Alan Rands, of this parish. First qp of triples - 1. Rung for the Lyddington Fete, and as a birthday compliment to Jack Atkinson.